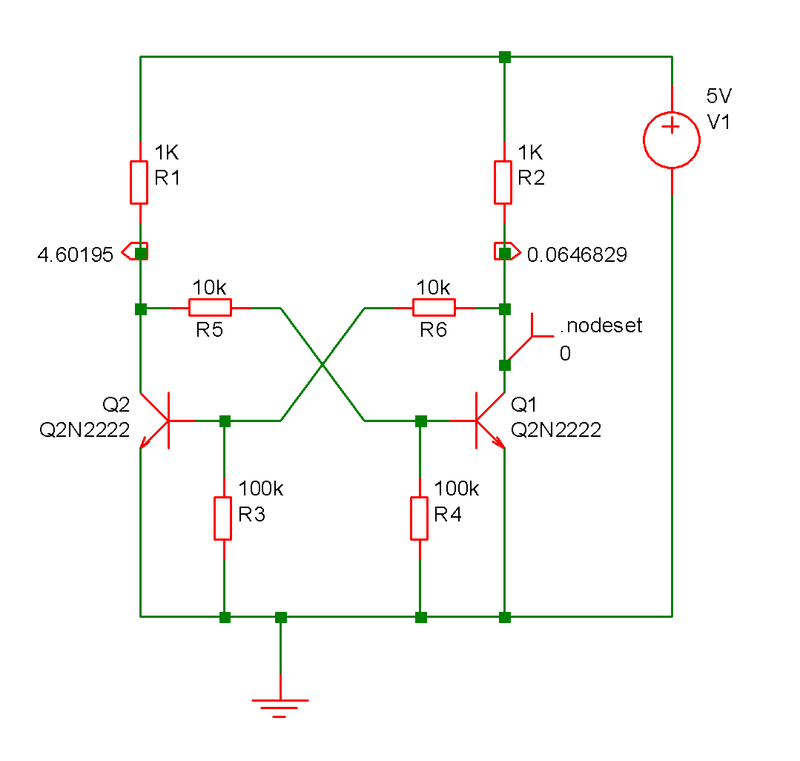 This statement sets an initial guess voltage at the specified node for the dc operating point solution. node1, node2 etc. Name of circuit node (or net) to which nodeset is to be applied. See notes below. Initially nodesets work exactly the same way as initial conditions. The nodeset voltage is applied via a 1 Ohm (by default but can be changed using NODESETRES option - see .OPTIONS) resistor and the solution is completed to convergence (by any of the methods). The nodeset is then released and the solution repeated. If the nodeset voltage is close to the actual solution the convergence of the second solution should be rapid. A nodeset has been applied to the collector of Q1. This has forced Q1 to be on and Q2 to be off. If the nodeset were absent the solution would actually leave both Q1 and Q2 partially on. In real life this would not be stable but it is numerically accurate. The other application of nodesets is to help convergence for the DC bias point. With SIMetrix, it is rarely necessary to use nodeset's to find the DC solution of a circuit. They can, however, be useful for speeding up the operating point analysis for circuits that have already been solved. You may wish to do this for a Monte-Carlo analysis, for example. SIMetrix features a method of creating nodesets for this purpose using the SaveRhs command. See Using Nodesets. Nodeset's should not be confused with initial conditions. (see .IC). Initial conditions tie a node to a particular voltage and keep it there throughout the DC operating point analysis. Nodesets merely suggest a possible solution but do not force it.